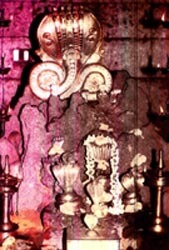 SHRI KSHETRA KUKKE SUBRAMANYA - Kukke Linga g, SHRI KSHETRA KUKKE SUBRAMANYA - Kukke Linga - Shiva Maha Purana, Vishnu Purana, garuda purana, bhavishya purana, skanda purana. The group of lingas is seen to the north of sanctuary. These are called kukkelingas. people used to keep them in the basket and worship. Hence this name is popular. At present, these lingas are in the back potion or the sanctuary and worshipped there only. Formerly this place was known as kukke-pattan, may be because of this name, it is popular as Kukkelinga. In Sanskrit ‘kukshi’ means ‘cave’, vasuki installed an image in the cave, hence this is called ‘kukkelinga’. The car festival of kukkelinga takes place ev­ery year on maker sankramana. Here Gods and sages have installed number of lingas.